It is vital to select the correct mat system for your job. Temporary roadways rely on the strength of the ground for support, but as this is different from one site to another and varies according to how wet or dry the weather is, it is always best to err on the side of caution. Therefore, the comfortable loading range for any mat system is usually around 1/3 or 1/2 of its maximum rating. You also need to consider that the longer the job duration, the greater the risk of rain softening the underlying ground, and therefore the more heavy-duty mat system you will need. If you need to use steel tracked machinery on your mats please remember that this will inevitably cause scuffing of the treads and potential damage to the joiners, especially where machinery is turning, so rubber tracked or tyred machinery is preferable wherever possible. 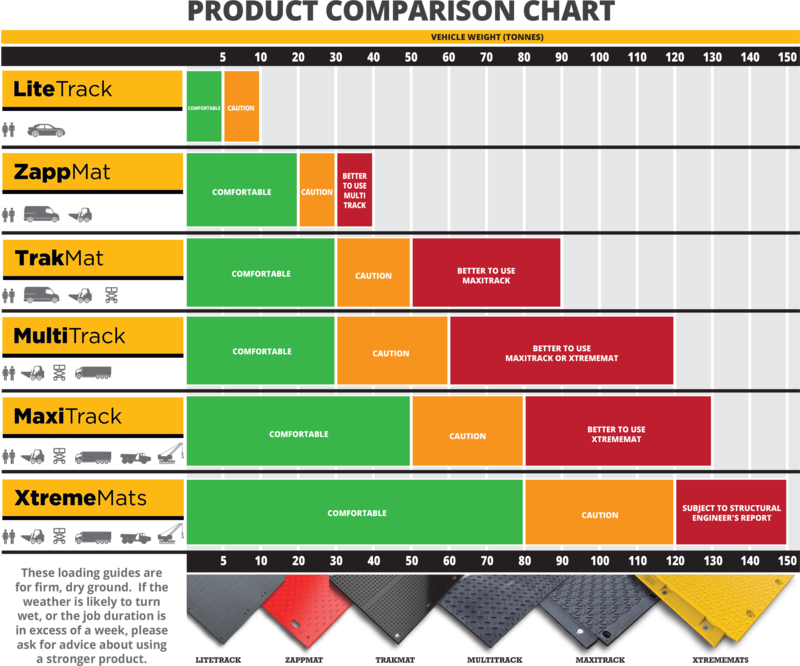 The Product Comparison Chart below shows the safe loading capacities that we recommend for trackway mats in the Ground-Guards’ range.